"I want to thank DV8, Hannes Langolf, Ermira Goro, Tanja Liedtke Foundation, Stefano Rosato and Juliet Knight to have opened a vast new door in my life. I will never forget that transformative experience." "Thank you DV8 for sharing some of the tools you have been developing for such a long time and your insight about storytelling. Thank you Tanja Liedtke Foundation … Getting this kind of opportunity and ‘high end’ knowledge is very rare and having it funded is such a gift so thank you so much." "I feel really blessed to have been part of this workshop. It was a great time not only of learning, but of sharing. I did not expect this overwhelmingly emotional bath of experiences and am just glad to have met all those wonderful and inspiring people. Thank you!" 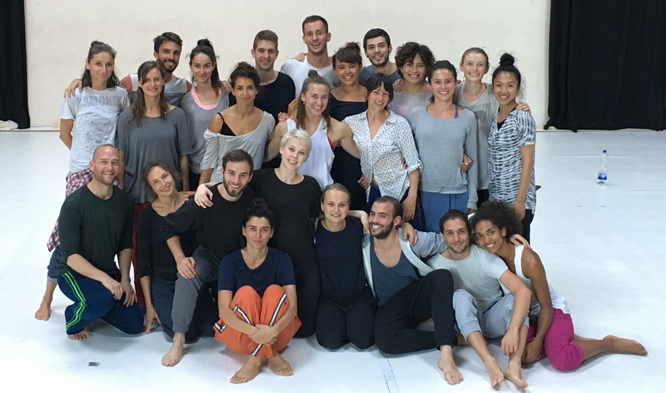 "I would say simply thanks: to Hannes, Ermira, DV8-Physical Theatre, the other participants and, above all, to the extraordinary generosity of ‘Tanja Liedtke Foundation’ which really made this experience happen. I never think that something can be given to me for free… That’s why I felt to compensate this big gift doing my best during the workshop. I won’t forget it." "I am thankful to be chosen and I would dive in and do this all over again!" This Intensive Workshop is a rare opportunity for professional dancers to experience DV8’s unique working practices. This two-week intensive course will be led by DV8’s Creative Associate, Hannes Langolf and long standing performer Ermira Goro. It will focus on verbatim physical theatre - the connection between text, meaning and movement - and understanding how body language influences performance. Dancers will be encouraged to confront their physical habits and develop a strong sensibility for detail and authenticity in choreography and the spoken word. Thanks to the generous funding received from the Tanja Liedtke Foundation, this workshop will be free of charge. There are places for 10 female and 10 male participants and we are looking for exceptional performers, who are keen to challenge and develop their training, performance and creative skills. Due to the nature of the work, all participants will need a good command of spoken English. register your attendance by emailing dv8@artsadmin.co.uk with ‘REGISTRATION FOR WORKSHOP OPEN AUDITION’ in the subject line. Please bring an up-to- date CV on the day. If you are selected to participate in the August workshop we will ask for a €150 deposit in order to secure your place. This deposit will be returned on your completion of the workshop.